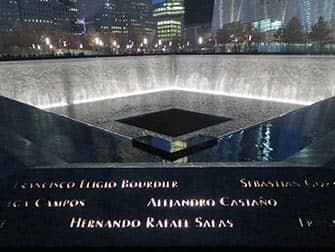 The 9/11 Memorial in New York, is the name of the memorial site at Ground Zero, that was built to honour the victims of the attacks at the World Trade Center in 2001, and, what some people don’t know: also for the victims of the WTC attacks on February the 26th, 1993. The memorial has been open to the public since September 11, 2011 and is freely accessible for anyone who wishes to pay their respects. Altogether, nearly 3,000 people lost their lives due to these World Trade Center attacks. All of their names are engraved in bronze on the two pools that form the core of the Memorial. 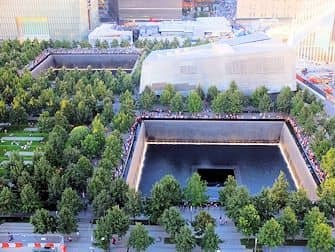 The North pool and the South pool are built on the exact spots where the twin towers stood. It’s an affecting place, with these two enormous pools, surrounded by trees. Especially in the dark, the feeling of sadness is intense. Is there an entrance fee for the 9/11 Memorial? No, the 9/11 Memorial is free of charge. The entrance fee to the 9/11 Museum $24. 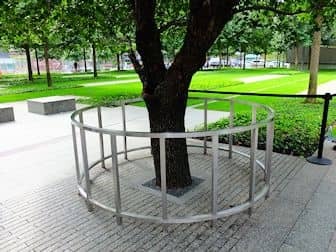 How do I get to 9/11 Memorial? The easiest way is by subway. Take the A, C, J, Z, 2, 3, 4, or 5 train to Fulton Street or the R to Cortland Street. Walk to Church Street. Then walk further down on Church Street and turn right on Cortland Street. You can also take the E to World Trade Center. What are the hours of the 9/11 Memorial? The 9/11 Memorial is open daily from 07:30 until 21:00. 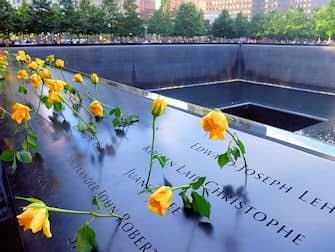 On September 11th the 9/11 Memorial is open to the public from 15:00 until midnight. Are there any tours I can take? Yes, you can take the official 9/11 Memorial Tour, led by a guide of the 9/11 Memorial and Museum. In 45 minutes, the guide takes you around the reflection pools and informs you about the World Trade Center, the events on September 11, 2001 and the creation of this memorial. You can also take a tour of the area – the Financial District – that was affected by the attacks. 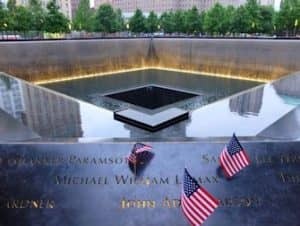 If you would like to know more about the 9/11 Memorial and the Financial District then you can take the 9/11 Memorial and Financial District Walking Tour. Can I visit the 9/11 Museum? Yes you can visit the 9/11 Museum. The museum is located on the site of the 9/11 Memorial. In the museum you’ll find a touch screen wall of faces. These are the faces of the victims. By clicking on them you are able to find out more information about any of the individuals. You can read more about the 9/11 museum here. Yes, you can bring a stroller to the public areas at the site, as long as it doesn’t obstruct the pedestrian traffic. Can I bring food or drinks to the 9/11 Memorial? You may bring a small bottle and snack with you. Mind that this is quite a quiet place though, where people are expected to behave respectfully. Where can I find more information about the Freedom Tower/One World Trade Center? You can find more information about the Freedom Tower/One World Trade Center here. What is the One World Observatory? The One World Observatory is the observatory in One World Trade Center. You can read more about One World Observatory here. Eric’s tip: I visited the 9/11 Memorial two days after it opened for the public. I found it very impressive, moving and beautifully designed. There were relatives of the victims from the attacks who left behind cards and photos at the names of their loved ones. I spent an hour walking around. Since then, I have visited the Memorial a number of times and have an extra tip: during the winter months, when it gets dark pretty early (around 16:30), the monument is beautifully lit. You can see this on one of the photos above.